Figure 1. 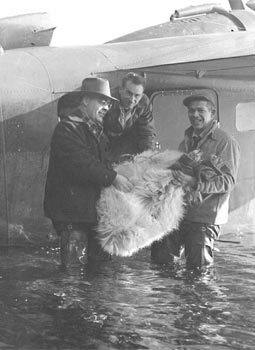 Mountain goat relocation from Kenai Peninsula to Hidden Basin, Kodiak Island, Alaska, 1952-1953. Kodiak Island is an 8,975 km² island in the western Gulf of Alaska separated from the Alaska mainland by the Shelikof Straight. Kodiak is approximately 160 km long and 16-96 km wide with the southwestern two-thirds of the island encompassing the Kodiak National Wildlife Refuge. Kodiak has a sub-arctic maritime climate and is comprised of mountainous, heavy-forested terrain on the north and east and moist tundra and hummocks in the south and west. The Kodiak Island mountain goat population originated from 11 females and 7 males relocated from the Kenai Peninsula to the Hidden Basin area during 1952 and 1953 (Figure 1). Since establishment, mountain goat numbers on Kodiak Island have increased dramatically with the first hunting season authorized in 1968. From the late 1960s through 1970s, goat populations were lightly harvested, and most areas were closed to hunting to encourage colonization. During the 1980s, the population continued to increase from an estimated 150 to more than 400 animals, with new pockets of goats observed on the southern end of the island. Throughout the 1990s, goat populations continued to grow, and the management scheme remained conservative. Mountain goats currently occupy all available goat habitats on the island, with confirmed reports as far south as Kaguyak Bay and west to Sturgeon Head. Current goat populations on the southern portion of the island are increasing and based on data from comprehensive aerial surveys, goat population estimates on Kodiak Island exceed 2,000. 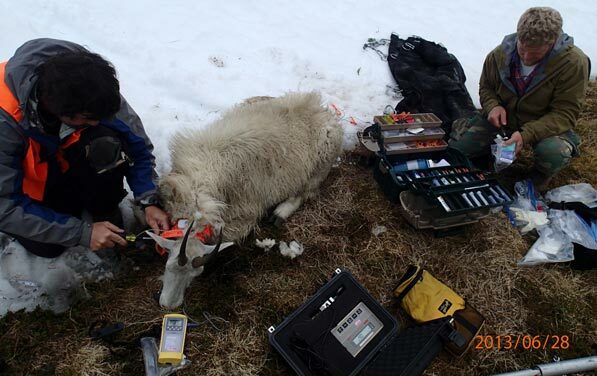 During 2013, in an effort to investigate movements, distribution patterns, and habitat use of goats on Kodiak Island, the Alaska Department of Fish and Game in cooperation with the Kodiak National Wildlife Refuge fitted 15 mountain goats with Global positioning System radio-collars (Figures 2–4). Figure 2. 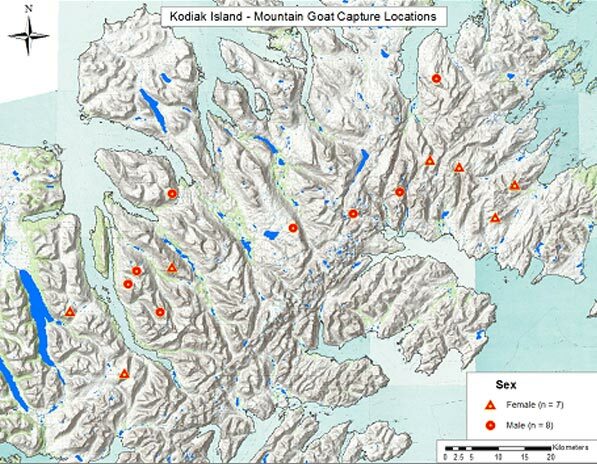 Mountain goat capture locations, Kodiak Island, Alaska, 28–30 June 2013. Figure 3. Biologists Kevin White and Jason Herreman from Alaska Department of Fish & Game fit a male mountain goat with a Global Positioning Collar during captures on Kodiak Island. Figure 4. 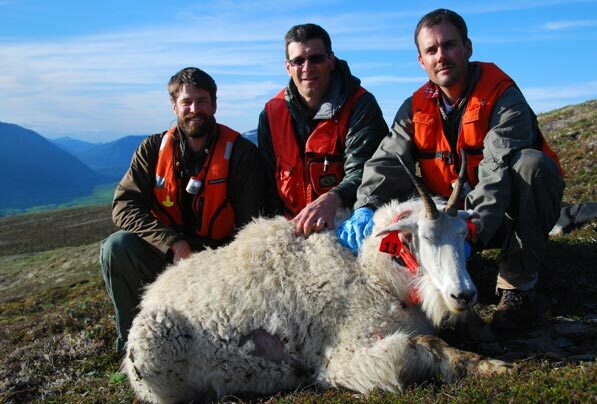 Capture personnel Kurt Rees (Kodiak National Wildlife Refuge), John Crye (Alaska Department of Fish and Game), and McCrea Cobb (Kodiak National Wildlife Refuge) with female mountain goat immediately prior to reversal.